Not listed in the directory? Become a member of the growing network of EDR/CDR Tool experts by joining today. This is an online training calendar listing all of the current courses available for EDR and CDR training. CDR Trainer/Mentors are experienced CDR Tool users and proficient in the delivery of a standardized CDR Tool curriculum. As Mentors, they are available and uniquely qualified to provide reliable after-training support. Now is the time to effectively position your image and expertise in the rapidly expanding field of Crash Data Retrieval and EDRexperts.com is the number one resource! As a CDR Tool expert user, you know imaging EDR data has been increasing each year and the Tool currently supports over 120 million registered vehicles.The use of EDR data by law enforcement crash investigators, those in private practice, insurance Investigators and fleet managers and this will be their resource for qualified expert help - your help - but only if you’re listed! Crash data in supported vehicles is saved in the vehicles safety modules (airbag control module, powertrain control module, rollover sensor) and recorded with the EDR functionality within that module. Numerous tests have been performed and the crash data has been recoverable in a number of extreme conditions including fire, submersion in water, freezing temperatures and more. Ever investigated a case/claim where there were multiple vehicles involved in an in-line collision? Many times it is difficult to accurately state if the “squeeze” car (the one in the middle) stopped in time but was subsequently pushed into the vehicle by the vehicle from behind OR hit the vehicle in front and then hit again in the back. With the CDR data, you can accurately assess this information based on the sequence of “events” recorded and the “positive” or “negative” acceleration recorded. Search EDR Experts to locate CDR Technician Trainers in North America. Simply look for the CDR Trainer/Mentor logo on the search results page. 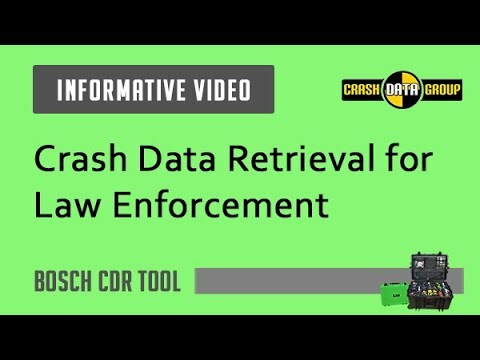 Crash Data can be retrieved with the Bosch CDR Tool using the CDR Interface module and a universal DLC cable. This method is called the DLC method and can be used as long as there is power to the OBDII vehicle port (DLC). Event Data Recorder (EDR) information retrieval is accomplished using the Bosch Crash Data Retrieval (CDR) Tool. This tool is currently used by law enforcement, accident reconstruction experts and insurance companies to provide a better understanding of what happened leading up to and during an accident. The Bosch CDR Tool provides pre-crash and crash data stored in the EDR of passenger cars, light trucks and SUVs. For more information on vehicle crash data retrieval, please click the research button above. Crash data in supported vehicles is recorded to the EDR located in the vehicles safety modules (airbag control module, powertrain control module, rollover sensor). Currently over 150 million registered vehicles are supported using the Bosch CDR Tool. This number continues to grow as more automobile manufacturers add new model years to the list. The following are currently supported manufacturer lines: Audi, Bentley, BMW, Daimler, FCA Group, Ford Motor Co., General Motors (GM), Honda, Karma, Lamborghini, Maserati, Mazda, Nissan, Pagani, Suzuki, Toyota, Volkswagen Group, and Volvo. Use the above vehicle list button to view all currently supported vehicles. 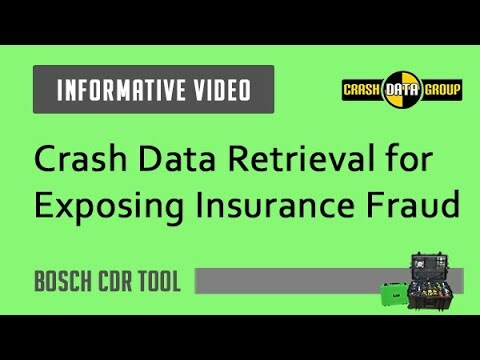 The Bosch CDR Tool is comprised of hardware and software that allows you to connect directly to the vehicle in question and "image" the pre-crash and crash data. The hardware allows the connection to the vehicle's EDR data and the software interprets the data and compiles a comprehensive CDR Report that can be saved as a PDF. Crash Data Group is the sole source Bosch distributor for the CDR Tool in North America. To learn more about purchasing a Bosch CDR Tool, please visit www.crashdatagroup.com or call (800) 280-7940. Crash Data Retrieval is fast becoming a necessary process in accident investigation and reconstruction. More and more attorneys and insurance companies are including "Crash Data Retrieval" as a criteria for selecting an expert. This web site can help you communicate your CDR expertise and also keep you informed on the latest research, training and uses of the Bosch CDR Tool. To sign up and be listed in our directory of EDR/CDR experts, please use the button above.